Supportive winter footwear is one of the most important foot health investments you can make as a resident of West Michigan. In our last blog post, we mentioned that inadequate gear, footwear that doesn’t fit correctly, and wet feet are three of the leading causes of winter foot injuries and conditions. Choosing the right gear – socks, shoes, boots, and activity-specific gear – will help you enjoy winter for as long as it decides to last this season. Overall, the key thing to remember about good winter socks is to choose moisture-absorbing pairs that fit. Below are several aspects to consider when picking out a new pair of socks. If you’re unsure what type of sock is best for you, come visit one of our West Michigan offices, where we offer an extensive selection of season-appropriate socks. Feet that are damp from sweat or from water soaking through your shoes chill more easily and are more prone to bacterial and fungal infections. This is why it’s so important to choose socks made with moisture-absorbing materials. Cotton socks and undergarments hold sweat against the skin. The sock worn closest to your skin should be made with wool or synthetic materials like polypropylene. These materials wick away sweat and offer great insulation. For extra warmth, wear liner socks, which are made of a thin synthetic material, under a pair of thicker wool socks. Examples of sock materials designed for cold weather include Coolmax®, Smartwool®, and Dacron®. The fit of socks is essential, and you may find you get extra support from foot powder and foot warmers. Socks must fit properly to provide support. Socks that are too small may force toes to bunch together, causing friction that could lead to blisters or corns. Loose socks allow for heat loss; they may also cause friction if the extra material folds or bunches. Wear full-length socks rather than ankle-length. The taller the socks, the more insulation they will provide. You may find that using foot powder inside your socks helps keep your feet clean and dry. Exercise caution with foot warmers. It’s best to consult with us first. Foot warmers can provide an added layer of protection when worn inside shoes; they can also cause severe harm for those with nerve damage and can burn the skin if worn incorrectly. 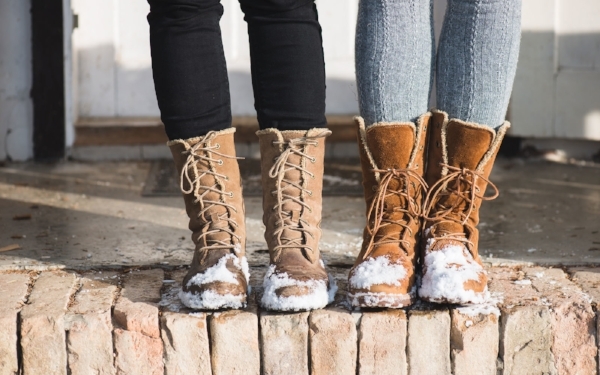 In general, proper winter shoes or boots should keep your feet warm, dry, and well supported. · Choose water-resistant and insulated shoes that are designed for cold weather. · The thicker the insulation, the more protection the shoes or boots provide. · Similarly, thicker soles offer more protection from the cold. More heat is lost through the sole due to conduction from the cold surface below than to the cold air around your feet due to convection. Consider adding a thicker insole to your boots for additional warmth. · Prevent slipping by wearing shoes or boots with low heels and traction soles. · Shop for new shoes later in the day, when feet are at their largest. · Try on winter shoes with your winter socks. Make sure the thickness of the socks doesn’t make the shoes too tight and that you can still wiggle your toes. Size up if needed. · However, don’t buy shoes that need to be grown into. Shoes and boots need to fit today to prevent blisters, chafing, and injuries. · Different winter activities require different types of footwear and other considerations. Use boots designed specifically for skiing and snowboarding. It’s particularly important to ensure that they fit correctly. · You can use orthotics in boots and ice skates for additional support. · Remove wet socks and shoes right away. Pack an extra set if you think your feet may get wet. · Consider wearing gaiters over your boots to keep your feet dry. If snow piles up on top of your boots, your feet are likely to get wet – even if they’re great boots! · Runners needn’t hang up their shoes during the winter months. Warm, lightweight, moisture-wicking socks are available at most running and sporting goods stores. [Note: Consider shortening your stride to maintain stability in slippery conditions. Read our blog post about preventing foot and ankle injuries while running for more tips. · Don’t wear your winter socks and boots while indoors or driving to your hiking/skiing/activity destination. Your feet will sweat and get wet. Instead, put your winter socks and boots on just before stepping outside. · If your feet begin to feel cold, get moving! Movement increases blood flow to your extremities. Winter activities are special – and so are winter conditions. Make a mental effort to check in frequently with how your ankles, feet, and toes are feeling while you’re out in the cold. We’re happy to discuss your particular needs to help you feel prepared for winter activities this season and beyond. Contact us today to schedule an appointment. Check back for winter skincare tips that will help you extend your foot health even further during the colder months.